Objectives: Students learn about the properties of snowflakes through reading a NASA press release. By viewing a NASA eClips video segment, students discover how snowflakes form and how their shapes relate to their history. Students then explore the geometric shapes of snowflakes by viewing them as polygons and calculating their areas using the area properties of right triangles. Common Core Math Standard: CCSS.Math.Content.6.G.A.1 Find the area of right triangles, other triangles, special quadrilaterals, and polygons by composing into rectangles or decomposing into triangles and other shapes; apply these techniques in the context of solving real-world and mathematical problems. CCSS.Math.Content.6.G.A.3 Draw polygons in the coordinate plane given coordinates for the vertices. Apply these techniques in the context of solving real-world and mathematical problems. Scientists and spectators at the Winter Olympics are all seeing the same ice and snow, but one scientist can see exactly how different it can be for each sport, by using light. Snow and ice can look like long tubes or tiny ping-pong balls. NASA scientist Peter Wasilewski is using "polarized" light to see if snow and ice is the right texture for different Olympic sports, and also creating beautiful colored pictures of the snow and ice. It's important to see the shapes of the snow and ice because in Olympic sports, they have to be different for each sport, whether skiing or snowboarding, figure skating or hockey. The shape of snow for example, can be tiny snow flakes or snow balls. 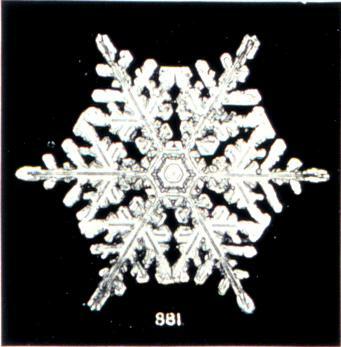 Typically, snow flakes, like the one shown above (NOAA photo) are not good for skiers, and can slow them down. By looking at the snow with polarized light, Wasilewski can see what type of snow is on the ground and if its right for skiing. "Ice is different for each Olympic sport," Wasilewski said. "The ice is softer for figure skaters than it is for hockey players. Figure skaters need to dig in with their toe picks for jumps. Ice hockey players want the hard ice that makes the ice fast and easier to skate on. With a microscopic look at the ice using the spectrum, I'm able to see how the ice differs." Wasilewski realized that color and shape of ice and snow changes depending on the thickness and direction of the ice. He got started by just playing around, making ice crystals in his refrigerator and photographing them. From there, the colorful art of snow and ice he calls "Frizion" was born.